In-depth look: We got our hands on Star Wars: Battlefront 2 multiplayer and it was awesome! One of the most anticipated games this year has to be Star Wars: Battlefront 2. Despite its predecessor releasing to a fairly well regarded reception, there was still a lot wrong with the game. For starters, there was no campaign/single-player, the ability to get into vehicles or become a hero was literally based on who can run to the tokens fastest, and the game lacked much depth to anyone other than casual gamers. With those complaints and more, EA and DICE went back to the drawing board to see what they could conjure up for the next iteration of the series. Fast forward to this year’s E3, and they’ve finally unveiled what they were hard at work on. I must say that from the trailer alone (below), it seems like they have corrected a lot of what fans complained about, as well as added so much more. There’s now a full single-player campaign led by the talented Janina Gavankar that fills in the 30-year gap between Return of the Jedi and The Force Awakens. On the multiplayer side though, that’s where we see the most changes. 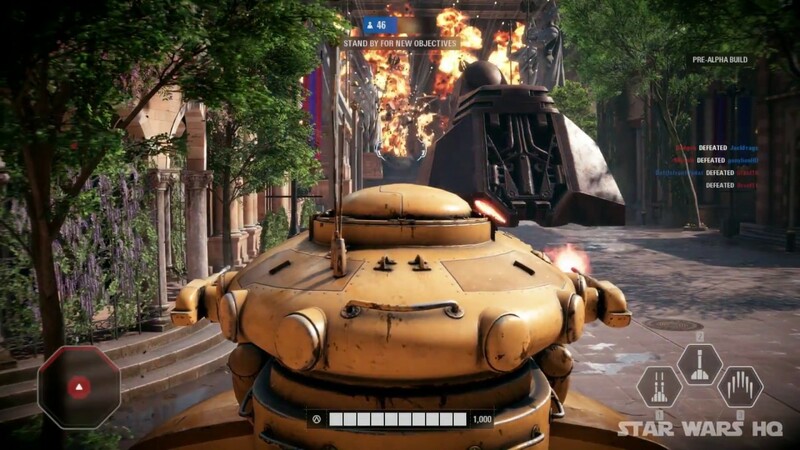 Among the multiplayer changes, DICE have blessed us with battles, characters, vehicles and everything in between from all of the Star Wars films thus far. There are new modes too, but the most notable change is that all DLC will be ABSOLUTELY FREE! That alone will definitely get some salivation in your mouth. Even though EA is throwing all the bells and whistles at us, we still had yet to see how the game actually played in person. At EA’s very own showcase outside of E3 called EA Play, we got our chance to be the first to get our grubby little hands on Battlefront 2. Even though we played a 20v20 LAN game on PS4, the game supports 32v32. Jumping in, we were playing the new Galactic Assault mode on the Theed map, which is similar to Battlefield‘s Rush and/or Operations. Our team was the Droid Federation Army going up against the Clone Troopers. We had 3 objectives to complete that were split into 3 separate phases. The first phase was defending friendly tanks against the opposition as they pushed towards the palace. They enemy team had access to Ion Disruptors (basically rocket launchers) across the battlefield. If we were successful, the next phase was to disable the security systems, which like in Rush, is basically “arming” them and stopping the other team from disarming. Getting past that brings us to the final phase, which is securing the throne room. To complete this, your team has to run down the ticker for the other team by getting kills. 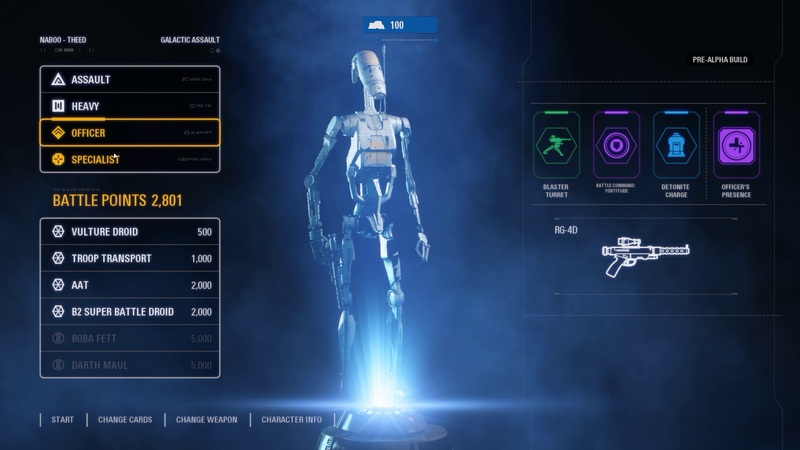 Right from the start, you can see that DICE have gone back to Battlefront roots by incorporating classes again, like it was with the originals. When choosing a character, you have 4 classes to choose from: Assault, Heavy, Officer, and Specialist. Assault is your basic Infantry class with a blaster rifle and pistol. Heavy carries a big rapid-fire blaster and has defensive capabilities like a mobile shield. This class is great if you’re trying to push. Officer carries a pistol with a scope, can drop turrets and has the ability to buff nearby teammates. Lastly, Specialist is the sniper class and can lay trip mines as well as scan the nearby area for enemies, revealing them. Returning from the previous Battlefront are Star Cards, but this time they’re a bit more fleshed out. Just like before, you can add them to your character to change up your abilities. The new part, however, is that they’re class-specific as well as tiered. The higher the tier of the card, the better that ability is. 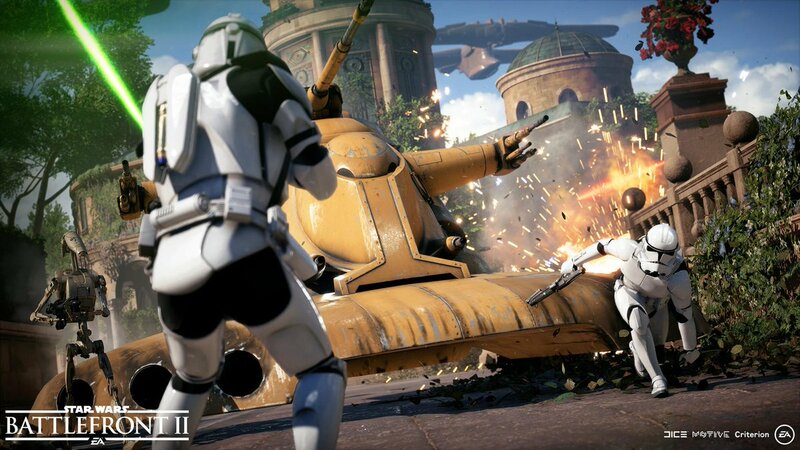 Players will be able to get Star Cards in a similar fashion to Battlefield and Mass Effect, with a sort of battle pack system. I decided to go in first as Assault, just to get a feel for things. Right away I could tell that DICE addressed a big issue from the first game, which was that the weapons didn’t feel like they had a kick to them. This time around, every weapon actually “feels” different in handling and firing, and definitely made it more immersive for me. I did also play as each of the other classes too, and I must say the uniqueness of each one was a pleasant change from the previous title. I would say that my favorite class to play as was the Heavy, because you’re literally like a moving wall and can obliterate most opposition in your way. As I was getting kills and assists though, I was racking up Battle Points. Now this is new mechanic being introduced that will replace those awful token pickups from the first game. Instead of players rushing to grab tokens for things like vehicles, heroes and power weapons, you’ll have to earn your way up. As you earn Battle Points from completing objectives, getting kills and assists, it will open up more options for you to use in the game; the more BP you save up, the better the rewards are. For the Droids, you have access to the Vulture Droid fighter, Troop Transport, AAT Tank, Super Battle Droid and of course, Heroes. Choices were either Darth Maul or Boba Fett. I must say that I love the changes DICE made to earn your way up instead of fighting to grab a pickup on the ground. 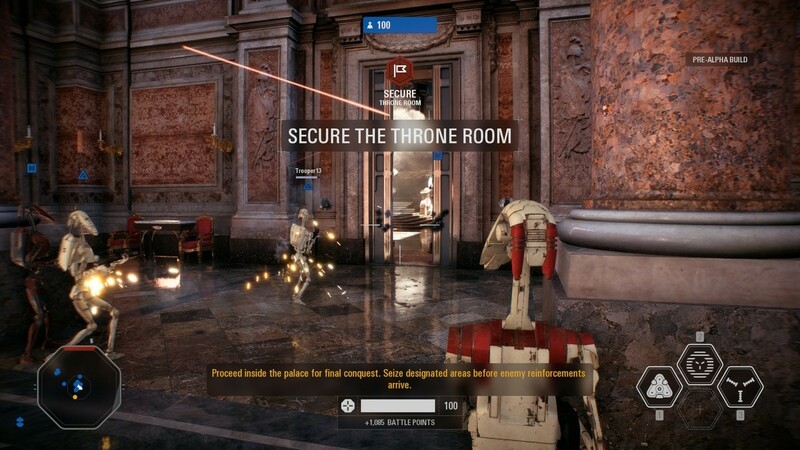 With my squad of 4, we traversed the area eliminating threats that came our way as we tried to guide our tanks to the palace through the streets of Theed. As we kept our team communication up, we were able to power our way through the first phase of the map. Next up was the assault on the palace and trying to disable the security systems. Things really got interesting here as many players started spending BP on upgrades as well as heroes (including myself). The battle was more than intense as we tried to take out the two objectives. The enemy team pushed us almost fully outside and it seemed like hope was lost. At least until Darth Maul entered the mix and me as Boba Fett. We led the charge with our teammates behind us, and the tide of battle started to change. We took out the enemy Rey and Han Solo, which allowed us to finally disable the security and move into the final phase of the map. All we had to do now was take the throne room, and we’d win the match. Unfortunately, that was easier said than done, as our foes weren’t giving up that easily. Everything was on the line and down to the wire, and everyone on both sides tried their damnedest to overpower the other. With lightsabers swinging, blaster fire whizzing by, and explosions going off all around, this was probably my favorite part of the entire match. Eventually, the battle came to an end with the other teaming winning by a hair. Although we lost, I had so much fun just in that one match. I can honestly say that EA and DICE have really been listening to fans and players alike, and have addressed as much as they can to deliver something better than before. There are a different feel and experience this time around and I really think Battlefront 2 will be able to give fans what they should have gotten the first time around. Now all we have to do is wait until it releases later this year on November 17 for Xbox One, Playstation 4 and PC. Are you excited for Star Wars: Battlefront 2? Let us know in the comments below. Also, check out some awesome gameplay from YouTuber JackFrags to give you a taste of things to come.